Dr George Sharkov is an Adviser to the Minister of Defense and served as a National Cyber Security Coordinator for the Bulgarian Government 2014-2017, also Adviser to the Prime Minister in 2017. He was leading the development of the National Cyber Security Strategy of Bulgaria, adopted in 2016. He has PhD in Artificial Intelligence (AI), with specialization in applied informatics, thermography and genetics, intelligent systems. 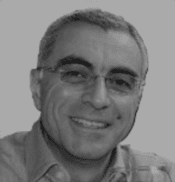 Since 1994 he was managing international software teams for financial systems, e-business and innovative e-markets. Since 2003 he is the Executive Director of the European Software Institute – Center Eastern Europe, with the Lab on Cyber Resiliency. Since 2016 he is also Head of the Cybersecurity Lab at Sofia Tech Park. He is trainer and appraiser for software engineering quality management, cybersecurity and resilience (SEI/CERT RMM), lecturing software quality, cybersecurity and business resilience at 3 leading universities. Pioneer in digital ecosystems development, cyber and AI research, startups support, digital SMEs competitiveness.